Strike while the iron’s hot—that’s my motto! Let’s take the initiative and attack our foes’ Aether Keep right now! Hold your horses, Sharena! You’ll need to organize an offense map before you go around raiding keeps. Offense maps let you place structures that will help you in battle. You can also use Aether Stones and Heavenly Dew to strengthen your structures, making your offense map even more powerful! W-wow, I had no idea! Well, it’s a good thing we’re taking our time getting ready. Haste makes waste—that’s my motto! Sharena… Why do I get the feeling that you’re trying to find a catchphrase? 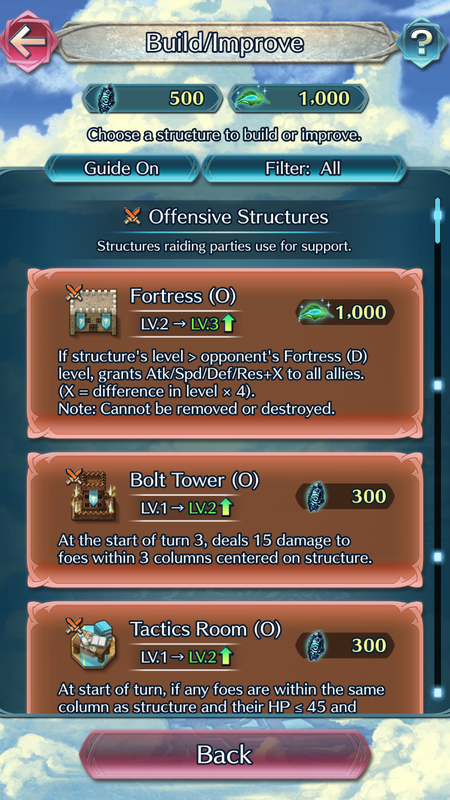 There are various kinds of offensive structure; for example, some restrict the range of your foes’ movements, while others can reduce the stats of certain unit types. Use Aether Stones to create structures, then place those structures on the map as you wish. Ideally, you should try to predict your foes’ team composition and strategy and place the structures in a way that will aid you in battle. Once you’ve created structures, you can then use Aether Stones to strengthen them, improving their abilities. Level Up the Fortress (O)! If your Fortress (O) has a higher level than your foe’s Fortress (D), it will increase the stats of your entire raiding party. You can increase the level of your Fortress (O) by using the Heavenly Dew received when you create or strengthen structures. Once you’ve collected some Heavenly Dew, don’t forget to level up your Fortress (O)! Take Advantage of Bonus Structures! Make sure to take the time to check which structures will be bonus structures in the next season. 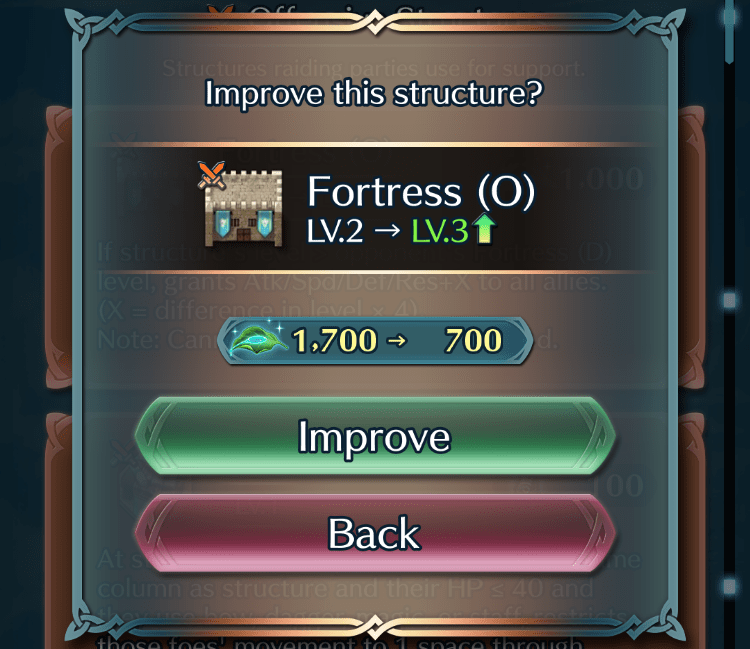 Placing bonus structures will increase the levels of your Fortress (O) and Fortress (D) by +1. 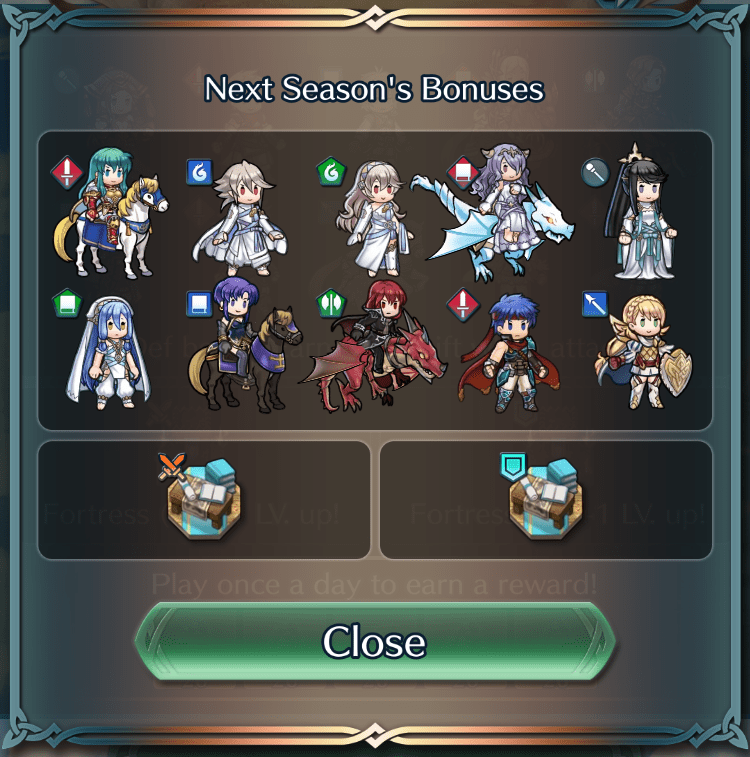 You might want to consider playing the long game by prioritizing your Aether Stone expenditure on creating bonus structures for the coming season.